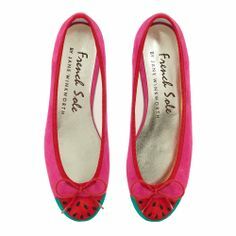 I saw these Watermelon shoes by French Sole in a magazine recently but couldn’t find them online at all. I just found this picture on Pinterest, but unfortunately I don’t know where I can buy them! This entry was posted in Shoes and tagged ballerina pumps, flat shoes, flats, French Sole, watermelons. Bookmark the permalink.